Before the arrival of the MIX series, Xiaomi's top-of-the-range series of devices was led by devices such as Mi 5 or Mi 6. 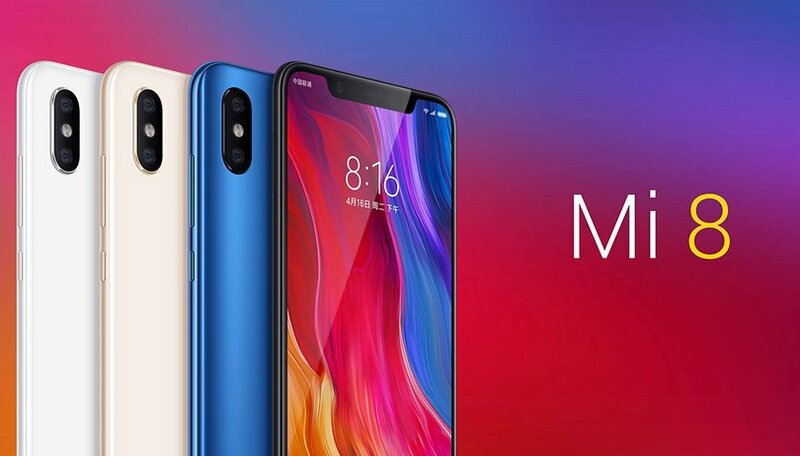 Now the Chinese company has made Xiaomi Mi 8 official in China, presenting the new flagship in three intriguing variants. Let's take a closer look at Xiaomi's new trinity. Do not expect big surprises from the design, the Mi 8 in fact reminds me a lot of the iPhone X, and all the other smartphones that decided to be inspired by Apple's flagship. An elegant, slim smartphone with an almost bezel-less display, a notch and a dual camera on the back. The Mi 8 adopts a 12MP dual camera on the back, the main of which boasts a Sony IMX363 sensor, Dual Pixel focus, optical stabilization system on 4 axes and aperture of f/1.8. The second is a telephoto lens based on a Samsung sensor. The arrangement of the double rear camera reminds us unequivocally of the iPhone X with that vertical positioning in the left corner. Xiaomi, however, taking a look at the DxOMark tests, manages to exceed Apple in the quality of these cameras: the Mi 8 is in fourth place with 99 points (flanked by the Galaxy S9 Plus) and followed by Pixel 2 and iPhone X. This could be due to the artificial intelligence that is manifested in the portraits (with the Studio Lightning function), in the optimization of the selfie (with Beautify), and in the recognition of subjects and scenes. What can be innovative about a GPS chip? The type of technology used! Xiaomi used a dual frequency GPS chip (L1 and L5) on Mi 8. This chip appears to improve the accuracy of position detection using GPS technology and eliminate interference from the surrounding buildings. Of course, it won't revolutionize the use of your smartphone, but it should speed up navigation. The Xiaomi Mi 8 boasts the latest Qualcomm processor, the Snapdragon 845, and joins it to 6 GB of RAM and 64/128/256 GB of internal memory. The front panel is almost entirely occupied by the Samsung AMOLED screen, which offers a diagonal measurement of 6.21 inches and an aspect ratio of 18.7:9. At the software level the Mi 8 runs Android 8.1 Oreo and the Xiaomi interface MIUI 9, but the update to the next version is already scheduled. The 172-gram smartphone is kept alive by the 3400 mAh battery, which can be recharged via the Type C USB port. It offers a transparent glass shell that allows you to see the internal components. Like the Huawei Mate RS Porsche Design, it features a fingerprint sensor integrated into the display that should be able to distinguish for the first time between different pressure levels. It offers 3D face recognition, which works just like on iPhone X, including Animoji. The price of the Xiaomi Mi 8 Explorer Edition is 3999 yuan, about $623, or £468. The Mi 8 SE, with its 5.88 inch AMOLED display and notch, is slightly smaller than the other two models. Inside is the Snapdragon 710, the chip recently released by Qualcomm that promises great performance for a lesser price. The Xiaomi Mi 8 SE is the smallest and also the cheapest model: it arrives in China with a price tag of 1999 yuan: about $311, or £234. Although we do not currently have the prices for markets outside of China, we will update the article with these details as soon as possible. What do you think about the new trio from Xiaomi? Has the brand stepped up into the big leagues? Not too impressed with the design. Also, what's up with the bottom bezel? I see too many phone manufacturers doing that nowadays. I don't understand why OEMs of android are jumping on bandwagon of stupid notch of an iPhone. I was expecting Xiaomi should come up with some new innovation on its 8th anniversary. Turning out to be just copy cat. To me at least, comparing something to an iphone is a negative statement, not a statement of quality or excellence. So the headline reads as this phone being just above poor and vastly overpriced.